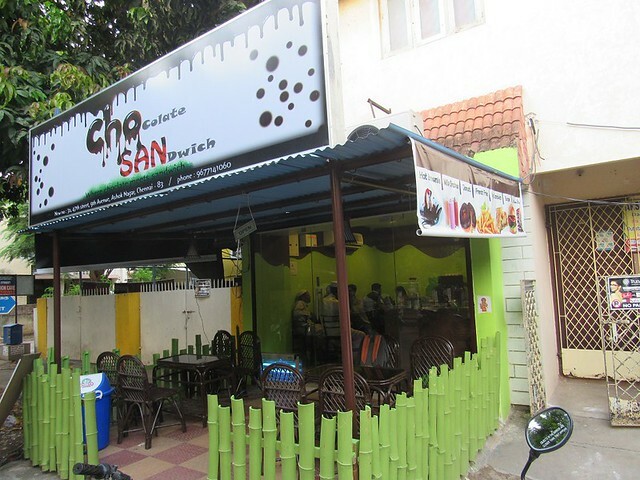 When fellow blogger Jeevan introduced me to Chocolate Sandwich shop @ Ashok Nagar, Chennai, I was all excited to go. 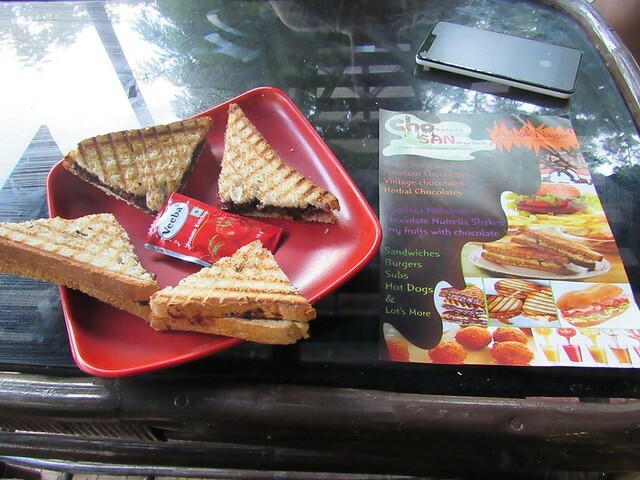 Because I love sandwiches and I have not eaten a chocolate sandwich before! When I went to the shop (Ashok Nagar 9th Avenue, opp. 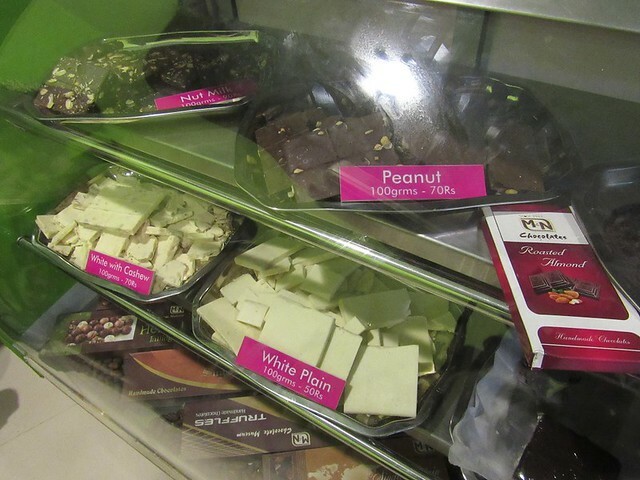 to Puliyanthope play ground), I found they offer much more than just chocolate sandwiches. 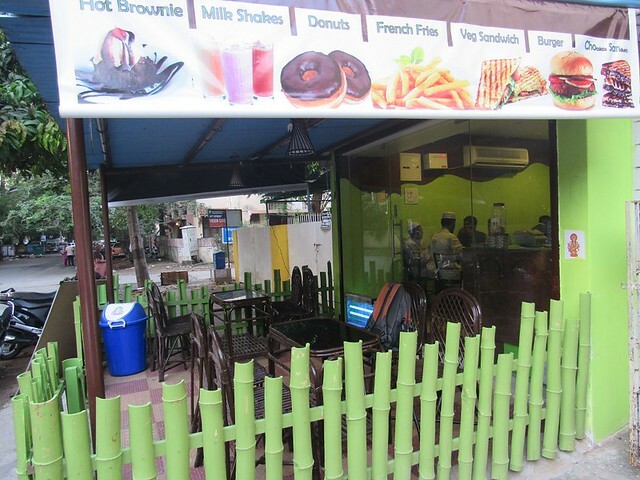 They have different types of chocolates, sandwiches, juices, milkshakes, french fries, etc. One of the partners of this shop dropped by and we had a long chat about many things. I asked him what’s special in their shop, and he suggested: Single origin chocolates (cocoa sourced from a single farm), sugar free chocolates, herbal chocolates, Hony Pe ja sandwich (Honey, peanut butter, mixed fruit jam), Hazelnut chocolate sandwich, Chocolate milk shake, etc. One interesting thing he told me about chocolates is: Don’t bite the chocolate as soon as you put it in your mouth. Keep it in your mouth until it melts, then eat it. I tried it with the white chocolates with nuts that he gave me, and the taste was good! You guys should also try this. It seems good chocolates will melt. Crossed this place many times, but did not check it out. Am on a non-chocolate diet for a while, so I guess this will have to wait :-D. And regarding the Dark chocolate, I read the same description in The Hindu, when they spoke about Vegan Dark Chocolates, to wait for a while before hurriedly biting it off. Thanks for introducing this place. Will check it out on our next visit to Chennai. I am hungry and I want to visit Chennai now. I have eaten chocolate sandwich before, but these ones look so tempting. Yum! Though I love chocolate, chocolate sauce, chocolate sandwich do sound too much for me.I love the plain old chocolate bar! This place would be heaven for my son! He loves chocolate in every form. Though, I would prefer the good old regular chocolate only. Nowadays I am not a big fan of chocolates, mainly for health, but I do eat them at times. I don’t like dark chocolates that are too sweet.